Here you should find the answers to the most common questions users ask. If you can’t find what you are looking for then please get in touch. Content is released on a regular basis, you can expect 1 podcast every 2 weeks except during holidays. I want you to do a podcast on a specific topic, what should I do? Get in touch and tell me your suggested topic. I want to feature in a podcast interview, what should I do? Get in touch! If your English is of a good standard and you have an area of law which could be of interest to listeners you may be able to feature on the show. Can I sponsor the show or advertise with you? Yes, please get in touch to discuss opportunities. You can support the podcast by making a voluntary payment here. Is corporate membership an option? If you have a small team you can become a TEAM-5 member which is a membership for up to 5 team members. Find out more about TEAM-5. If you have a larger team, get in touch to discuss options. MEMBERSHIP: Which membership is right for me? There are a range of membership options available. You can read about each one using the links below. Find out more about LIGHT membership. Find out more about PRO membership. Find out more about TEAM-5 membership. MEMBERSHIP: What happens when I sign up? When you sign up you must fill out a form and enter your payment details via the secure payment gateway. You can either use your credit or debit card or your PayPal account. When you have signed up you will be sent a confirmation email. You can also login immediately and access the Podcast Pro material straight away. You will have access to a membership dashboard where you can view your profile, update your details and information related to your membership. MEMBERSHIP: Do you offer any discount? Yes, from time to time we offer promotions. Sign up to the newsletter to get the latest news about this. MEMBERSHIP: I am having problems seeing membership content, why? If you are having problems viewing content it is probably because your membership has expired or you have not paid your subscription fee. Check you account settings (Dashboard > Account) and make sure you are paying for your account. If you do not want to continue as a member but want to see the podcast on the site, you must do stay logged out of the site. Do not log in. MEMBERSHIP: Can I access my benefits on my phone? Yes, so long as your phone has internet and a web browser you should be able to access the website from your phone. You will not be able to use the speak module on your phone as the current technology is not compatible. MEMBERSHIP: Can I try membership for free? You can see all the Podcast Pro and TEAM-5 features for episode 1 here for free. You can see the content for episode 32 here. Remember that LIGHT membership only includes the synched transcripts in the podcast player and downloadable PDF transcripts. You may be able to get a free trial depending on which membership you choose. See the options here. Yes, you can cancel anytime via your membership dashboard. An alternative is to pause your membership which means you can restart your membership at anytime after a short break. MEMBERSHIP: How do I access speak module? The speak module is currently only accessible on computers and not on smart phones. If you cannot see the speak module on your computer it is probably because this uses external technology embedded into the site from Vocaroo and sometimes this is hidden by the browser for security purposes, don’t worry it is safe to use! To view the technology click on the top right hand of your browser on the shield and then click ‘load unsafe scripts’. This will show the speak module voice recorder. 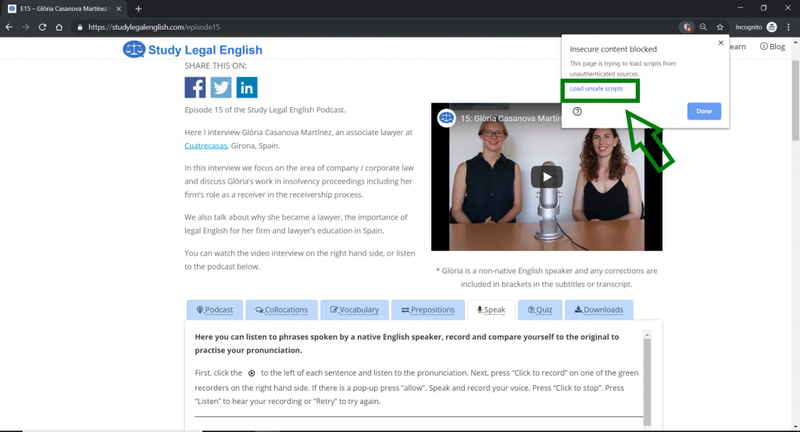 If you are concerned about loading the Vocaroo plugin on Study Legal English directly, you can use the technology on the external website here: https://vocaroo.com (it is the exact same technology). This is not an ideal option for users and I am working on updating this to make it more user friendly in the future. LIGHT: What is Podcast LIGHT membership? LIGHT membership is a budget membership with some basic features. Find out more about LIGHT membership. LIGHT: I can't see the transcript on the episode page, why? This feature is being implemented. For now, you must access your membership benefits on this LIGHT membership page. PODCAST PRO: What is Podcast PRO membership? You can find out about all the features and benefits of membership here. You can also see the content from episode one. You can find the new Podcast Pro Classroom features here. PODCAST PRO / TEAM-5: How do I get certificates? You can get certificates when you take a course. You can download these certificates and also share them on your LinkedIn profile. For more information about certificates and badges visit the achievements information page. PODCAST PRO / TEAM-5: How do I share my Podcast Pro achievements? PODCAST PRO / TEAM-5: How do I stop receiving quiz results' emails? Please get in touch to stop your quiz result emails. PODCAST PRO / TEAM-5: What is 'Podcast Pro Classroom'? Podcast Pro Classroom is a set of new features for Podcast Pro Members being introduced on new episodes in 2019. Gradually the features will replace old Podcast Pro features in previous episodes. You can try out Podcast Pro Classroom here. TEAM-5: What is TEAM-5 membership? If you have a small team you can become a TEAM-5 member which is a membership for up to 5 team members. Find out more about TEAM-5. TEAM-5: How do I add sub accounts? TEAM-5: How do I delete sub accounts? Go to subs > Sub Accounts > find the sub account you want to delete and click ‘Remove’. TEAM-5: What happens if I remove a sub account? That user will no longer be able to access any member benefits. TEAM-5: Do I need to check the boxes about emails when I import sub accounts? TEAM-5: What do I do if I get an error message when importing with the CSV file? Make sure that you save the file in the format ‘CSV (Comma delimited) (*.csv)’. Do this and try importing again. TEAM-5: Can the main administrator account access membership content? Yes the admin can access member benefits. The administrator is like a member and has the same benefits as the sub account members. The administrator account is only different because it is the main person responsible for paying for the whole umbrella account, the sub account members do not pay. For LIGHT and PRO membership your payment will be processed by Study Legal English using either Stripe or PayPal. You do not need an account with either of these payment processors and can pay with a credit or debit card using these options. For TEAM-5 membership the option of paying via a bank transfer is also available. PAYMENT: My payment is not being processed, what should I do? Make sure that your payment information is up to date. You can do this by going to your member dashboard > Account. Make sure that you have entered the correct security information. The best thing to do if you continue to have problems is to contact your bank directly and authorise the payment.